On her way home Jessica finds a fortune teller tent and purchases a beautiful, glowing green medallion. As soon as she shows it to her husband Robert, the magic of the Amulet explodes and steals her husband soul, living him lifeless. Jessica pledges to help Robert and mysteriously wakes up in a new, magical world where she soon realizes the witch has collected many victims. In this lost, magical world she embarks on a journey to free her husband and all the other victims of the cruel witch with the help of lost souls, ghosts and mysterious statues who offer their help hoping to be set free. 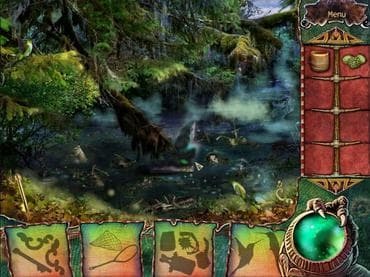 Download free full version game today and guide Jessica in her journey through magic locations by building magical artifacts and finding many hidden objects in beautiful locations as well as solving intriguing mini games and puzzles. Free Game features: - Amazing rich graphics; - Delightful mini-games; - Engrossing storyline. If you have questions about The Witch’s Green Amulet game, please contact us using this form.